How does food get from where it is grown or raised to where we buy it? What was the last thing you ate and from where did it come? If it was a packaged food and there were many ingredients listed, from where did they all come? Has your food traveled to more countries than you have? While our global food system provides variety, it also has a major impact on our environment. We are also becoming removed from our food sources. What is the answer to this growing problem? These are just some of the questions the Green LIONS Garden Group explored at our last meeting. We explored how the food that nature provides for us is delivered to our plates. We learned the definition of carbon footprint and discussed how food that travels many miles to our community stores contributes to this footprint for each individual. With most food traveling an average of 1500 miles to where we buy it, 20% of the average American’s carbon emission output is due to our food buying choices. How can we positively affect this growing problem of food transportation on an individual level? The answer is buying locally grown food when it is season. Is this an all or nothing suggestion? Absolutely not. But if the average family spent even $10 a week on produce or other food products grown or produced locally it would have such an amazing impact on not only our local economy, but our own health and the health of our communities. Students learned of how scarce the land is to even grow food on our planet. We used an apple as an example to represent the earth. After cutting it into four pieces we explained that 3 parts of the four are covered with water. The remaining fourth we cut in half again and explained that one of these parts is covered with land that is too mountainous, cold, dry, wet, or otherwise unsuitable for growing food. One eighth of our planet is now left and we then sliced this into four slices. Three of these slices are already covered by cities and highways. The one tiny piece remaining represented the remaining land available to grow food and clothing for billions of people. This exercise emphasizes the importance of taking care of our land, and at a closer level how we can properly steward our own piece of land at school where we produce food. 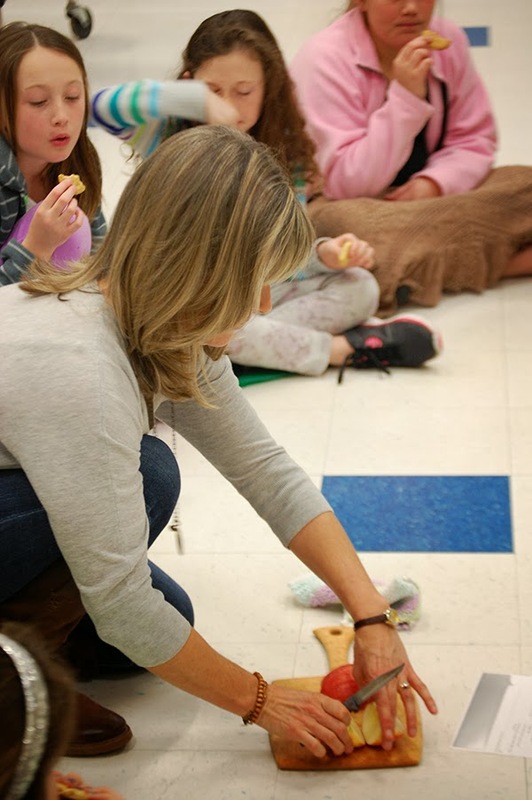 Exercises like the one above helps students see how important their food choice decisions are to keeping our planet healthy and to guard the small amount left on which to grow food. By supporting our local producers and eating seasonally we can do just that. We used another game to express how many steps are taken in producing a food product. Scenario number one: We want to make a pizza and have a crust but no pizza sauce. What do we do? We used a ball of yarn and 24 steps to show how a jar of pizza sauce comes into our kitchen, including growing and processing the tomatoes, the herbs used in the sauce, the cans for the processed tomatoes, the jars used for bottling the sauce, the journey to the grocery store, etc. 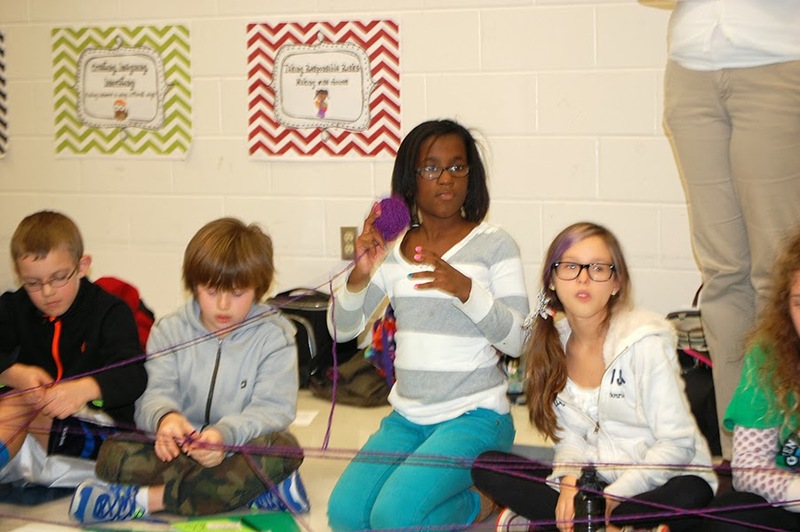 Each student held a step and a corner of yarn to create a large web of steps on the pizza sauce’s journey. Scenario number two: We go into our own garden in the summer and pick tomatoes and herbs, or go to a farmer’s market in the summer to gather these ingredients, or into our own pantry or freezer where we have canned or frozen local summer tomatoes to make our sauce. The students holding the now needless steps in the pizza sauce journey let go of their corners and the web was visibly much smaller with only about a third of the steps remaining. 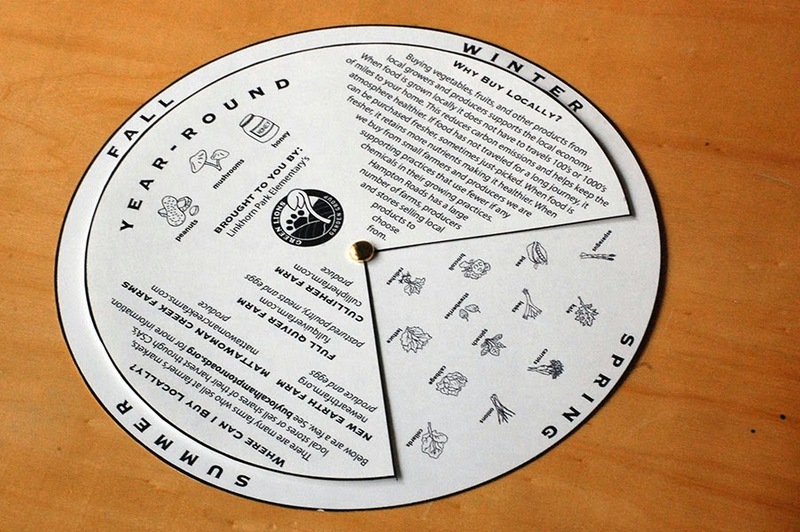 This represented the lessening impact on our environment when we choose local and seasonal produce. Students took away a thought-provoking and empowering lesson on how they can choose to make a difference in the health of their own community by encouraging their families to eat locally and seasonally from the many stores, markets and farms carrying food products here in Hampton Roads. 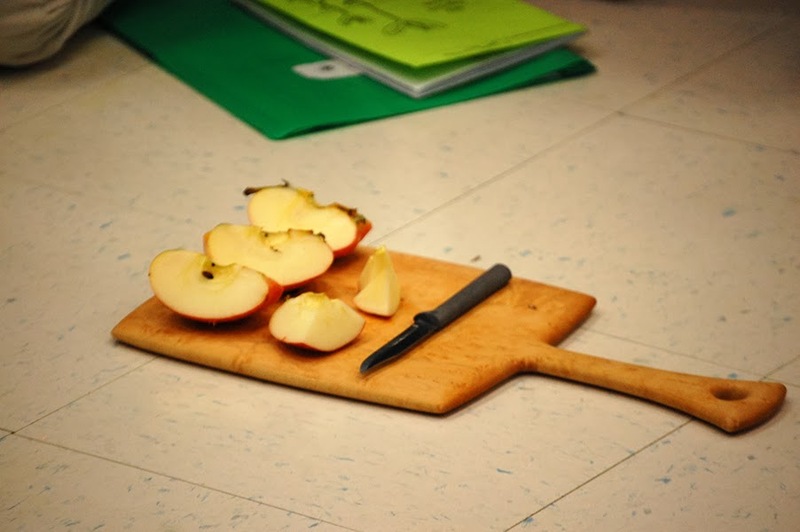 They were also able to take home their own tool to learn which produce grows when in our area, our program’s own Local and Seasonal Food Wheel, so they can find their favorite fruits and vegetables when they are growing and available. Small steps make huge impacts. Happy Eating!